This guide will explain how to use custom content files that are in .package format in The Sims 3. Make sure you've read Sims 3 CC Basics first! While this guide to .package files explains how to get the .package files in your game, TS3 CC Basics explains all about custom content in general, including using zip/rar/7z files, identifying file types, and what information to look for before downloading particular files. A more step-by-step, guided version is available in Game Help:Downloading for Downright Dunderheads. If you have ever had your custom content in Program Files (either manually or using the Helper Monkey/Monkey Bars), you must uninstall Monkey Bars/Helper Monkey, and remove the old framework files from Program Files path first! If you don't, some of your custom content may not work! You must also get updates from the creator(s) for any hacks/mods before putting them in the Documents path shown below. For full instructions on switching over from the old way to the new way, see: Installing Sims 3 Package Files: Old Way to the New Way. Do this first, then come back here for instructions on installing to Documents. Also make sure you have read TS3 CC Basics so you know how to extract from rar/zip/7z files and how to identify file types before continuing with this page. Depending on what patch/update level you have (and any expansion packs), you may need some extra steps to get your .package content working correctly. The easiest way to find your game version is to open the game Launcher. Look down at the very bottom left corner - you should see some tiny little icons. Float your cursor over the far left one and it will tell you your base game patch version - you need to have at least patch version 1.12.70 or later. If you don't see the icons at all, you need to update your game! We STRONGLY recommend fully updating your game to the latest patch version! Latest patch versions: Click on Game Help:Patch Table to verify your games are up-to-date. 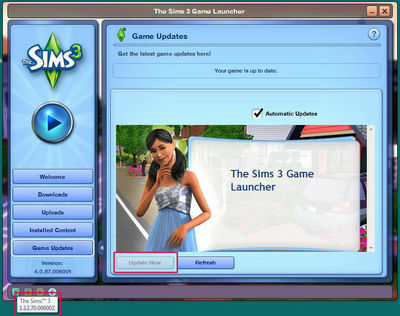 To update your game: Click on the "Game Updates" tab in the launcher and click Update Now. For more information on updating your game, or to Patch manually, see: Patching The Sims 3. This page has been accessed 4,391,333 times. This page was last modified 08:42, 27 October 2012 by SimsWiki user EllaCharm3d.